Postcard and flats (larger than 4×6, but still only one sheet) are the most common mailing we work with, and what can seem to be a pretty simple thing to design, can be more complicated than you’d expect. 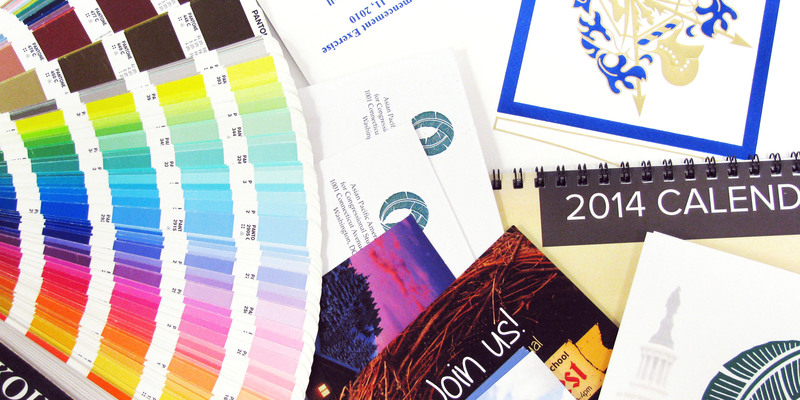 It’s ideal for postcards to be laid out in a way that works in harmony with mailing technology. Planning your design in a way that makes it easier for the Post Office machinery and regulations will help your mailing get to its destination without an issue. Here are a 5 quick tips to help you design your postcard or flat effectively. During the mailing process, the Post Office prints a barcode 5/8ths of an inch from the bottom of each piece. It’s best to keep this area blank; if they can’t print directly on the area, they’ll instead put a sticker over the bottom with a readable barcode. Any information or imagery will get covered up in that case, so avoid putting anything important in that area. Postal regulations ask for less than 10% ink coverage on the side of the postcard that’s getting the address. While it’s likely that a postcard will mail even with slightly more ink coverage, keeping the background white is the easiest way to make sure there won’t be any issues. When designing a mailing, keep in mind that the clearer the font is, the faster and more likely it is to get to your recipient. Addresses are scanned via an OCR (Optical Character Reader) machine at the post office that processes more than 55,000 per hour, that information is used to sort postcards and letters for their destination. Simple, common fonts are usually best, especially if they don’t have a serif (the tails and embellishments on certain letters). We suggest Arial, since most computers have it, and it’s easy to read. Also, choosing to use Arial (or your other selected font) for other content on your flat item will give your piece a more consistent and cohesive look. However, you can certainly style your address panel, just try to avoid very scripted fonts such as: Script MT Bold, Lucida Calligraphy, or Palace Script MT. Postcard and flat sizes vary between 3.5×5 and 8.5×11, which means the amount of space you can work with will be different with every size card. The Post Office requires 3 inches from the right hand size of card and the address should be printed on the top half of the card. Depending on the size of your card, this could leave some room below the address for other information or any graphic that you’d like to include. If the mailing is greater than 500 units, the Post Office will offer bulk mail discounts. This allows a company to print a permit number, called an indicia, in the corner in lieu of a stamp. If you choose to do mailing services, this might be a better option. Keep the top right corner clear of any printing, and it will ensure that the indicia will be readable for the Post Office’s OCR machines. If your mailing is going out with live stamps, it’s still a good idea to leave that area clear. Sometimes toner or ink may lay thick on top of the paper, making it harder for the stamps to adhere. We look at stamps as live money, as should you, so don’t lose them! Knowing a little more about the process can help you design and lay out your postcard with its use in mind. These tips will save you the headache of having to have your postcard redesigned or rejected by the Post Office. You can also save the time altogether, by checking out our resources page here (that should be a link) or have our in-house design team work with you on a print-ready design. Send us an email, support@ctrservices.com, we’re here to help.